On the anniversary of any traumatic event, old emotions that we may have been too overwhelmed to deal with in the moment can resurface. Even if we thought we'd processed them all, sometimes another layer bubbles up asking to be healed/released. This is because unexpressed emotions can get stuck in our emotional body and even our organs if it's too much for them to handle all at once. Grief, for example, is processed by the Lung; Anger by the Liver; Fear by the Kidney. One gentle way to help move these stuck emotions out of our emotional body is through The Six Healing Sounds Qigong. The Six Healing Sounds is a self-healing technique developed by Chinese Taoist shamans and sages thousands of years ago. They learned through deep meditation that each of our internal organs vibrates at its own frequency. The shamans then developed simple sounds and movements for each major organ in order to unblock stuck emotions and stagnant Qi (life force energy). This helps increase the Qi flow along that organ's meridians and balance the emotions, sending heavy energies down into Mother Earth (this does not harm the earth). It is from the ancient Taoists that acupuncture was also developed. Tonight, after opening sacred space by calling in the archetypes of the Taoist medicine wheel along with the indigenous ones, LinDel will give a brief overview of The Six Healing Sounds. Then she'll teach you a few simple Qigong movements (all of which can even be done seated). 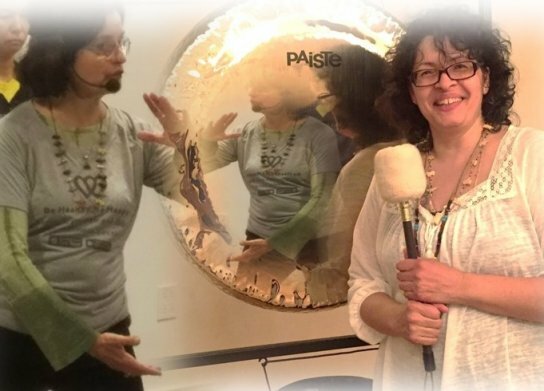 Once we begin the movements, Judith Grasshopper will weave in the sounds of her gongs and Tibetan singing bowls - with a different bowl or gong for each of the Six Healing Sounds. By integrating physical movements with sounds, you help bring those healing vibrations more deeply within. As we peak towards the end of the evening, Judith will bring us to stillness as we soak in the healing vibrations of her beautiful, rich gongs. Door open at 6:25 until 6:40 pm afterwards lobby doors are closed. Judith "Grasshopper" is a certified Karuna Reiki Master Teacher, Shamanic and Crystal Practitioner offering certification programs in various levels of Reiki Healing. Initiated and an Indigenous MedicineWay Practitioner, Completed program at NY Open Center under Integrative Sound and Music Practitioner training. Competed a Sound and Sonotherapy program at Sage Academy of Sound Energy. Gong Master Certification. LinDel Sandlin has been avidly practicing Tai Chi and Qigong meditation for almost 30 years. She's been teaching them for over 5 years in various places on Manhattan's Upper West Side. She's a certified instructor in the Universal Healing Tao system created by Grandmaster Mantak Chia. LinDel is also certified in the earth-based energy healing modalities of Crystal Healings, Sound Healings (Chakra tuning forks) and Shamanic Energy practices. To learn more, visit www.Facebook.com/TaiChiShaman or LinDel.SmilingChi@gmail.com or call 646-207-0753.